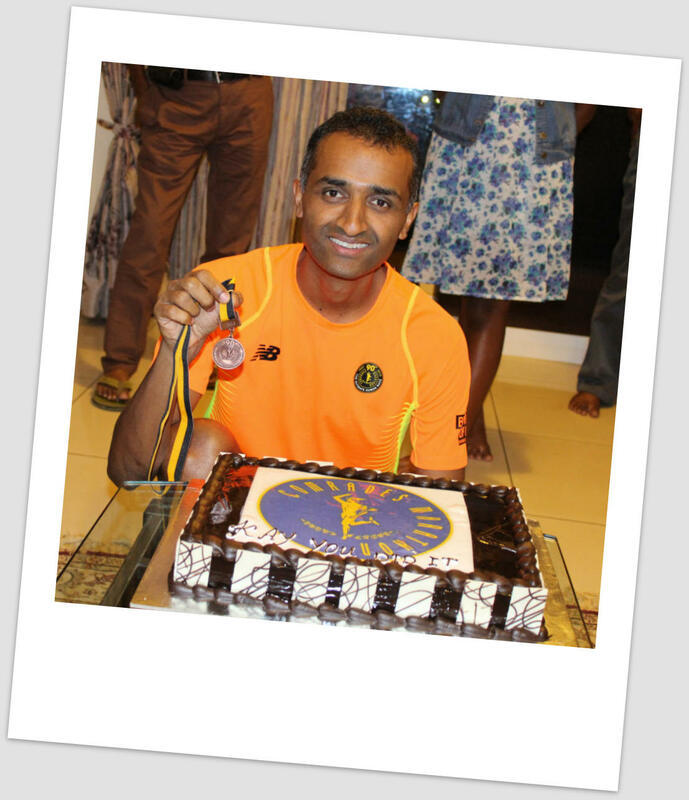 Read my Comrades Marathon 2015 preparation story here..
"The best and most beautiful things in this world cannot be seen or even heard, but must be felt with the heart. —Helen Keller"
I'd like to huuuuuuuuuugly thank my friends and family for showering me with love, care and excitements during my training for this super ultra marathon and also on the big Comrades marathon day!!! It was a very humbling experience to complete the Comrades Marathon 2015 between Durban and Pietermaritzburg in 11 hrs and 46 mins 17 secs just 14 mins well within the official 12 hours cut off mark. Yes!!! 11 hrs 46 mins of running, it looks absolutely crazy to me when I look back. There were 16588 runners who started the race on that day and I finished 10822nd. Being a solitary runner by myself, I ran this race with the company my alter ego, the inspiration from other runners and the energy gained from the hi-fives and cheers from the charming spectators till the finish. Now, I have another medal to adorn my wall of honor and a proud bearer of a fondest memory that will stay with me and my family throughout our life. A 50+ miler and the longest ultra marathon in 4 years since I started running, truly tested my endurance, commitment, perseverance and patience. At the end of this short journey I'm a happy soul to finish it with flying colors. Running is such beautiful thing and every time I step out to run I experience something so unique. 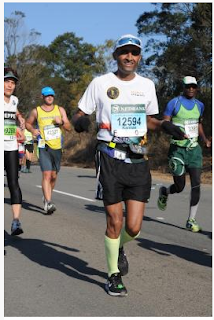 Comrades Marathon provided me an experience of lifetime to witness great athletes (get a lots of inspiration from them), people of all kinds from many parts of the world, the charming spectators, the way the running had stuck on to so many lives and much more..... Its truly wonderful. For an endurance runner Comrades is not a difficult race to think about as it is described. This is something I realized after the race. Anybody who can plan and execute a long run can very well crack it head on. It is certainly a wonderful race and also an experience to be part of. I can confidently say that with a thorough preparation and a realistic race day plan combined with the belief to stay focused for multiple hours while enjoying the run….minus stressing about the whole thing again staying away from injury at the start line....will guarantee a finish. I’ve experienced what it is to run in steep and rolling hills on a sunny day shoulder to shoulder with thousands of runners. Not to forget sweat, pain, cramps and of course myself. 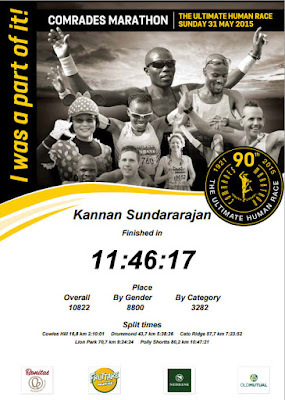 Its wonderful because I heard many spectators shouting my name “Kanaaan go for it!! !”, “hey he is from India, Go India go!!’. It was wonderful because some of the runners touched my shoulder and said "you are doing great" – these were free supplies of fuel available to my sore legs. It was simply magical. South Africans and the runners were truly amazing. The best part was even I had the opportunity to fuel many others during the course which suddenly made me very powerful. I was so inspired to see runners of different sizes and shapes shattering the myth that runners have to always 'look' fit. The capabilities seen there were simply unbelievable. I had a great respect for a pair of runners who went past me after Lion's park. Anton, a blind runner, was assisted by Tobie by barely connecting him with a yellow band. They were looking absolutely stunning, focused and running steadily. I did not see them till the finish and later I found that both had finished in 11 hrs 28 mins. Wow!!! It is also common to find many veteran runners (green club members who have 10+ Comrades finishes) who show you that they are the masters of the 5 big hills. Cancer survivors, biggest losers (obese turning into good athlete through sheer determination). There are so many inspiring stories to read at the end of this super event. Also, some crazy runners running for some amazing causes....like Farai Chinomwe, the master beekeeper, who's unusual running style has inspired the millions, also called 'the Rasta man' who runs backwards. Last but not the least....the Rhino Man who is known for running marathons and ultra marathons with his crazy super heavy outfit weighing 11 kgs. My cute little family including my Father in Law converted a wooden plaque to hang my Comrades medal. 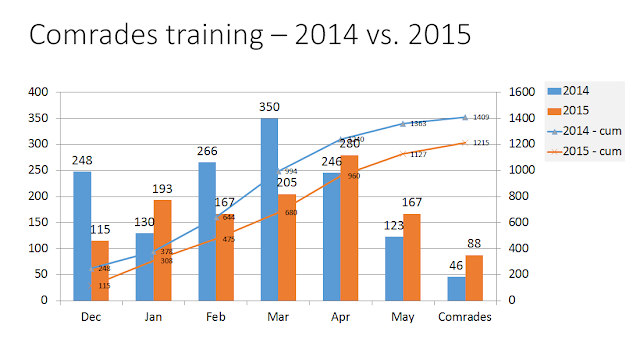 My training for the 2015 Comrades started on the 29th of Dec 2014. 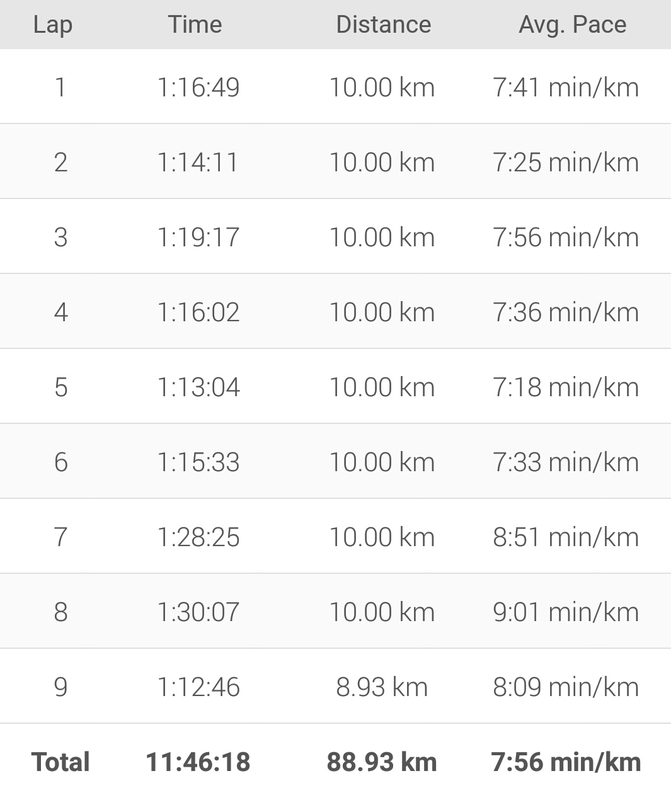 Having missed the 2014 run, I decided to have a a very conservative plan (ran 1038 kms as part of my training between Jan and May before the race). Last year I ran 1400 kms (including the 248 in Dec) without a proper foundation. Last year with a lot of running and little recovery during the training I was struck by an injury. This year I focused on optimizing my mileage and also improving my training methods with adequate amount of recovery in between. From December I also started focusing on optimizing my weight in a healthy way and bring my BMI closer 20+. I was very successful in doing that so by saying strict no no to Sugar and a big yes yes to a more balanced diet (lots of protein, soups, fresh vegetables and fruits, nuts and legumes) and sticking to a strict healthy soup only diet almost on all nights. Thanks to my expert chef and nutritionist, my wife for her loving care and attention that I received during the last several months. Even after the Comrades the soups appear in our dinner menu almost every day. During the last several months I spent a lot of hours in understanding several aspects of this race. I paid special attention to the running strategy and how the Comrades course should be run as described by those who tasted it in the past, the elevation profile, the expected weather & temperature on the race day etc., and combined with my own performances in the past - I came up with two plans. 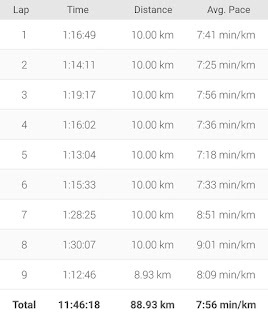 The Plan A was to target a sub 11 hour finish and Plan B (red in the pic below) to target just a Finish - and decided to be extremely happy about one of the results. The plan also helped me in adjusting the pace on the race day. I also decided to stick to the Plan A till the half way point and then continue to pick one depending on the race day experience. When I reached Drummond - I was very closely following my Plan A - but I was skeptical about three things. 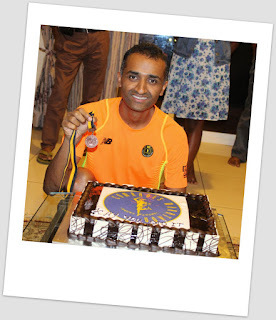 Firstly, I had never run beyond 67 kms and had no clue on how my body will react after that. Secondly, the temperature was not much in favor as it was soaring close to 28-29 degs and I was concerned about cramping severely - this was affirmed by the time I had reached Drummond I had already witnessed multiple runners bailing off due to cramps. Thirdly, my fuel / hydration plans were never tested beyond 67 kms and I had strictly decided not to bonk and suffer at the later part of the race. At that time, I decided not to chase the 11 hr finish but to stick to the Plan B to finish the race comfortably. I never liked the design of the traditional pacing chart which usually comes in as a snap on wrist band; it lacked intelligence and did not really provide anything beyond just the KM mark and the pace. I decided to make one for myself. 2 days before the race while sitting in the hotel lobby in Durban, I decided to make something that could be conveniently carried and has all the information that I wanted during my run. I created one with the comrades up hill profile in the backdrop and marked the elevation gain and loss, the cut off points, the Plan A and Plan B paces, expected time to reach and finish etc., I took a printout of it in A5 size paper and carefully put it in a soft plastic cover. 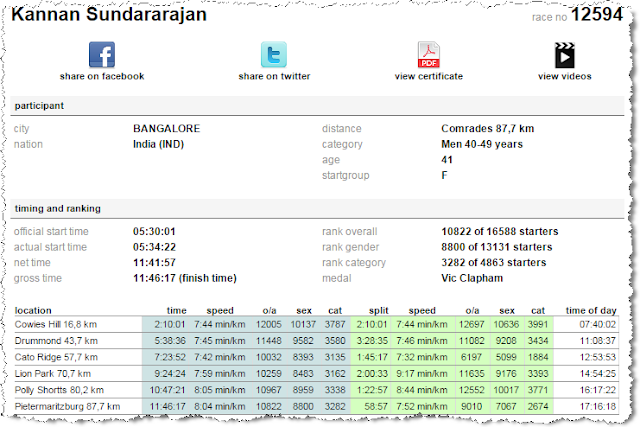 The elevation details helped me in understanding the profile that I would be hitting in every 10 kms interval also helped me in focusing only that particular section. Pic: my Comrades 2015 pacing chart. I setup my Garmin for a 10k lap and it helped me to focus on my race in 10k intervals. I never bothered about constantly looking at Garmin and adjusting the pace every single km. I also did not use my heart rate monitor this time just to reduce one element of discomfort even thought I had trained with my HRM during all my long runs. I was so confident that my average HR would be in the range 135-145 BPM and decided not to bother much about it. After 60k, my right leg Vastus Medialis started cramping and I had to use salt tablets at least 4 of them till the finish line. My fuel and hydration went really well otherwise and I used Gu gel till the first 30 kms and then the Enegrade, water, coke (initially diluted with water and the raw one after 65 km) and potatoes till the end of the race. I also had realized that the cramping intensity increased whenever I switched from walking to running. My walking and running strategy early on came handy during the Comrades. This is something that I must really work on the next time. The Polly shots was a killer climb at the end and it took away a lot of time from my reserve while walking up the hills. I spent almost 40 mins walking between the two Polly's. I was so elated to reach the top of Polly and decided to run without stopping anywhere till the finish line. 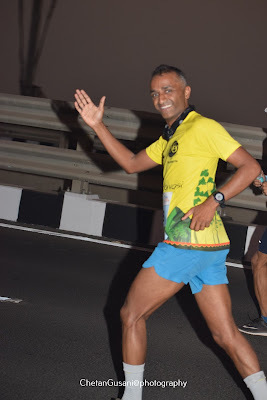 I was all set to finish the race just before the 12 hour cut off but when I saw the 4 kms to go sign I decided that I will finish the race before 11:40+ hrs. The final 2-3 kms I sprinted with joy while crossing hundreds of runners slowly marching towards the finish line. The last 500 meters was a further good sprint and I did not even realize that I forgot about the cramp or any kind of discomfort; nothing bothered at that time and I was just flying. Finally, when I touched the finish line, it was a very emotional moment and all that I wanted was a warm hug from my my wife and children who provided me everything to reach the finish line on that day. After collecting the medal and posing for a picture :), I called my wife, spoke to my children.....what a great moment it was! Truly the stars, moons and planets with a perfect alignment on that day. I'm also grateful to good friends like Pastor Samuel and his family, Pastor Nathan and his family, Lincoln and Nisha for their wonderful hospitality - they just provided space in their heart to make me feel South Africa my second home. This race has really altered (in a positive way) some of my internal belief systems. I love running again and again...as the Olympic motto says Citius, Altius, Fortius....and behaving simply like the honey thief - I have tasted Comrades twice (one and a half to be precise :)) and I will take efforts and go there again. Next year being a down run - I will focus on different aspects including cross training especially swimming which I recently fell in love with, more reading and research to do, more exciting time to spend on re-discovering me further. 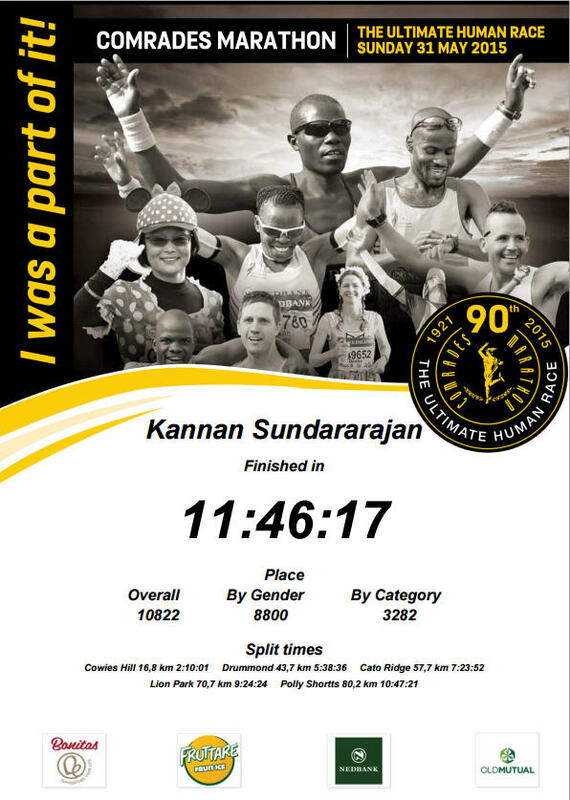 I still have my unfulfilled dream of running a full marathon under 4 hours and I'm planning to focus on cutting the time by 16 mins this year- this will also be a good Comrades 2016 qualifier and also to get into the D pen next year while giving me a 2-3 mins advantage at the start line. As Norman L Kerth suggests, I would continue to mine the timeline for gold and wisdom however tiny the find would be. I've an innermost desire to identify someone who finds this as an inspiration and starts focusing on leading a healthy / happy life especially by running or through any active sports. 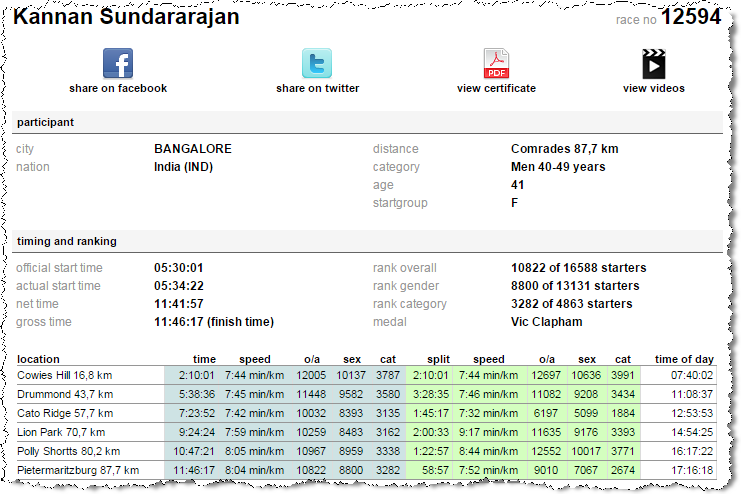 The official race distance was 87.7 kms and the Garmin finally showed 88.93 with an error of 1.2 kms. I compared my performance with Gift Calahe (hey why not!!!) (1st in Men) and Caroline (1st in Women) - utter craziness they ran almost twice my speed :). Amazing to find Caroline picking up her fastest course run during the last 10 kms. 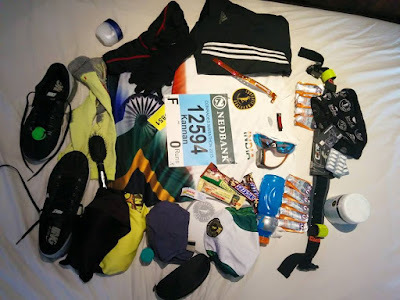 Alright - you are a novice runner and decided to run the Comrades - you might wonder what you could be doing besides running....here are my thoughts. Firstly congratulations for having thought about this. This is the first thing that any novice runner can do to start thinking about Comrades besides running smile emoticon - in my opinion - do indulge, indulge and indulge...in reading a lot about the Comrades marathon, read the greatest stories written by runners from all walks of life, fastest runners, slowest runners, success as well as failure stories, get inspired by watching Comrades marathon, start - end videos in YouTube, especially the spirit of Comrades and the good luck video posted by @peterslaufblog, keep dreaming about it day and night, get charged up every time you imagine you at the start line, running through the big 5 hills and also crossing the finish line, get ready to fail and get ready to succeed and improve. At last, make sure you have a life outside this running, spend adequate time with your family and do take good care of your health. The section below this contains Comrades marathon related tips for novice runners and also especially from the international runners point of view, what to expect and recommendations from me based on my own experience. Do visit the international runners area to meet and greet other runners and also have coffee, cool drinks, energy drinks etc., / rest and relax. The race is shown live in the www.comrades.com website. The runner position also can be tracked there. The race results can be tracked by a smart phone application ULTIMATE LIVE. Download and find the Comrades Marathon race, search for the runners to track and add them (click the Star) as your favorites to track their movement during the race. 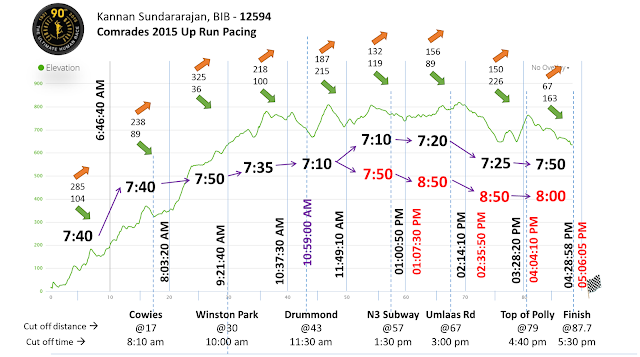 The app also shows the approximate position of the runner based on the average pace recorded at the timing mats. The race day photos and videos are uploaded in the following site - the pictures will start appearing in this link 2-3 days after the race. Wait for at least a week or 10 days to consolidate the pictures and then place your order. To run the Comrades Marathon one must qualify by running a full marathon in sub 5 hours. Unless you are a very slow and steady runner and you feel like running another 2-3 hours after running a full marathon in ~4 hrs 45 mins you may find Comrades a difficult race. Focus on improving your PR and take it closure to a sub 4 hr 30 mins comfortably before signing up for the Comrades. Allow at least 6-8 months before running Comrades after your PR is achieved. I ran a 50k Ultra in 6 hrs in November 2013 and a 4 hr 19 mins full marathon in Jan 2014. This gave me a lot of confidence for mentally get prepared for signing up for the Comrades. I WILL ,I WILL ONE DAY EMULATE YOU. Hi GK, Thank you and glad to know about your interests....feel free to reach out to me if you need any support.